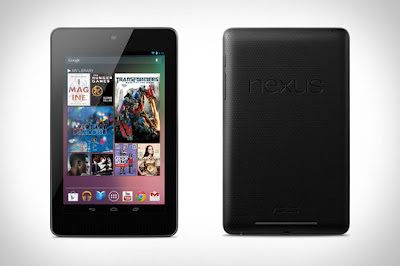 How many Nexus 7 units have Google & Asus sold so far and how many do they expect to sell this year? Those are the questions everyone wants an answer to and I'm going to attempt to do just that. Digitimes recently reported that suppliers will be shipping 4 million touch (OGS) panels for the Nexus 7 in Q3 2012. Based on this, and some other data we already have, we can make an educated estimate of the Nexus 7's sales volume. From the Digitimes report above, TPK Holding & Wintek are the suppliers for the Nexus 7's OGS panels. The two companies shipped one million units in June and 1.4 million units in July. Including the 1.4 million units in July, they have received orders for 4 million panels in Q3 2012. These figures should be equal to the number of Nexus 7 units going into production in each of those months/quarters. We also know that the initial shipment volume delivered to Google was 600,000 units in June. We also know that Google had initially estimated sales of 3 million units by the end of the year. This means that after looking at initial demand, Google & Asus may have roughly doubled their estimates and cranked up the production volume. Using these figures with Little's Law gives us a cycle time of 2.5 weeks, i.e. it takes 2.5 weeks to produce and deliver a Nexus 7 unit to Google. Since monthly production volume stays at roughly 1-1.5 million units, production capacity is unlikely to be a constraint. Therefore, we can assume a constant cycle time and calculate the total Nexus 7 orders delivered to Google at the end of each month. Once we have the Nexus 7 units available with Google, all we need to do is calculate the initial "sell-through rate" to get an estimate Nexus 7 sales so far. The Nexus 7 went up for sale in mid-July and the 16GB units were sold out in a week and we heard initial reports of sell outs of the 8GB version in 3 weeks. Since we know the size of the first production batch was one million units, it is a reasonable estimate for sales volume at that time to be the same. Also, since we know that Google had ordered more 8GB units (as compared to 16GB units) the "sell-through rate" would be about 2-3 weeks. In order to normalize the sell-through rate for demand fluctuations throughout the year, we can assume a conservative sell-through rate of 4 weeks throughout the forecast period, i.e. any batch of Nexus 7 units delivered to Google take about 4 weeks to be sold (either online or to stores). Based on the 4 million units produced, we can estimate a sales volume of approximately 3 million units in Q3 2012. This was approximately the same as Google's original estimate for sales in H2 2012 (Jul-Dec). Now, Q4 is where this gets a little more challenging. 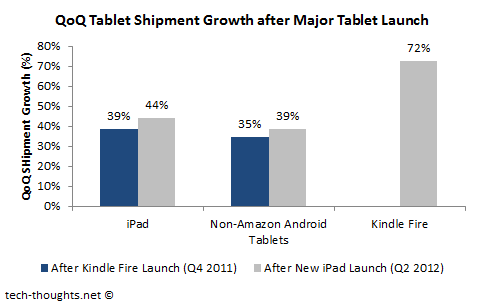 The original report from Digitimes states that monthly shipments of OGS panels are expected to drop to 0.1-0.4 million units because of increased competition from the iPad Mini and the new Kindle Fire. It is a little unclear if this is the shipment per supplier or the total number of shipments. In any case, such a production drop is extremely unlikely as there is tremendous market demand for high quality tablets at that price point. While the competition will have an impact on market share, rapid market expansion will ensure healthy Quarter-on-Quarter (QoQ) shipment growth for major devices. In addition to this, Q4 is usually a period where demand surges because of holiday sales. In order to set a benchmark, let's take a look at the impact of the last two high profile tablet launches on the QoQ shipment volume growth of their competitors. As we can clearly see from the chart above, major tablet launches have had no adverse impact on the sales growth of competing tablets. Based on this data, 35-40% seems to be a reasonable estimate of QoQ shipment growth of the Nexus 7 in Q4 2012. However, the fact that we have two major tablet launches coming in Q4 (New Kindle Fire & iPad Mini) could cause a greater negative impact than seen previously. Therefore, it may be a better idea to consider a larger range of production volumes. Taking a 35% QoQ sales growth as a mean estimate, with the limiting condition that sales are unlikely to fall from Q3 to Q4, we get a sales estimate of about 3-5 million units in Q4 2012. This takes the total sales estimate in 2012 to 6-8 million units. These numbers would be a huge boost to Android tablets in their market share battle with the iPad and, in combination with the new Kindle Fire, would put them well on track to meet my mid-2013 market share expectation. 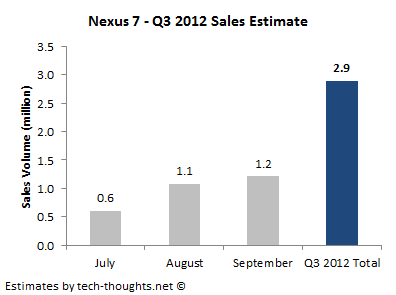 Conclusion - Based on these data points, the estimate for the current sales volume of the Nexus 7 is over one million units. In total, we can expect about 3 million units to be sold in Q3 2012 and another 3-5 million units to be sold in Q4 2012. I think you failed to take in account the distribution channel. Nexus 7 is actually available in US & UK, that , for comparable product those 2 countryies represent just 35 % of the WW market. If they were an HW company, they will release it everywhere as soon as supply constrain is over. In that case a 10 M is more likely. But may be the decision is linked to the Play store itself or with some agreement they have with Androids Tablet vendor and they will avoid entering new market..
You're right about that. I ignored it on purpose because we have no hard information on when distribution will be expanded. That's another reason why I thought it may be better to take a range for Q4's sales estimate. I think Google has reasons to expand distribution and reasons to hold back as well. You caught that part about their agreement with OEMs. Their goal was to show vendors how to compete with the iPad and they've done that. Now, OEMs need to emulate this strategy - Acer is the first to do this with the A110. September 3rd seems to be the almost official release date in France/Germany as well. So that might give a boost to September & hence, Q3 sales. Since my Q4 sales estimate is a range, I still expect it to be roughly around the higher end of that range.